You’ve made it! It’s May, and that means summer is right around the corner. The school year is coming to a close, family trips are on the horizon and everyone is ready to dust off the grill and pull out their flip flops. But May is more than just a lead up to Memorial Day festivities and the vacation season. It’s also National Water Safety Month. Before you round the kiddos up for a beach trip, or let them jump into the pool, make sure your entire family is armed with the knowledge of how to be safe in and around all bodies of water. 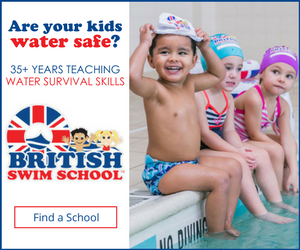 Read (and re-read, and then read again) these very important water safety tips from our friends at British Swim School. Then grab your shades, unearth the bathing suits, and dive right into summer fun. Keep the littles away from pool drains, pipes and other openings to avoid entrapments. Pool drain entrapments can happen when a swimmer’s body or clothing become entangled in a faulty drain or grate, causing drowning or serious injuries. When you’re at the beach, it's a good idea to only swim in places that are supervised by a lifeguard. The lifeguard is trained in CPR and First Aid and is able to identify a swimmer in need. Going to a waterpark? When using water slides, always go feet first. If you’re not a confident swimmer, wear a life jacket on the rides and in the pools. Parks typically haven them, but bring your own just in case. The American Red Cross recommends 9 feet as a minimum depth for diving or jumping into a pool. Leave the shallow end for hand stands, underwater tea parties and Marco Polo! Above all have fun! What kid doesn’t dream of a summer vacay at the beach or remember the good times at their local pool? With a little bit of caution, and taking these tips into account, your family is on its way to a soaked and safe summer! 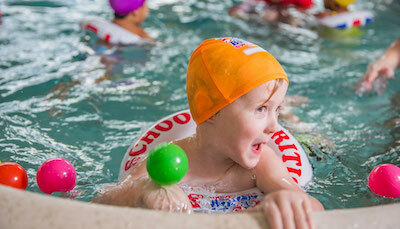 Your littles can start safety and swimming skills as young as 3 months at British Swim School. Whether you're a tadpole, minnow or shark, there's a class for every age and level. Water safety starts here. Dive in, be safe and sign up your kiddos for lessons now.